To sweeten the savings even more, be sure to grab the specially marked boxes of General Mills cereals that contain money saving General Mills coupons for up to an additional $6 in savings on other great breakfast favorites. Disclaimer: I received a complimentary General Mills prize pack like the one listed above for the purpose of writing a review and hosting a giveaway. Regardless, I only recommend products or services I use personally and/or believe will be a good fit for my readers. The views and opinions expressed on this blog are purely my own. Results may vary. No monetary compensation was received. The coupon that I am most likely to print would be the one for Lucky Charms. It's my husbands very favorite cereal. My favorite General Mills cereal would be Honey Nut Cheerios. I also like regular Cheerios. The coupon that I am most likely to print would be the one for Lucky Charms. My kids really enjoy it. Golden Grahams is my favorite General Mills cereal. Save a dollar on two big G cereals is the coupon that I would probably clip. when you buy Vanilla Chex® cereal. Choosing just one cereal as "favorite" is really hard. I tend to like the sweeter, dessert-type cereals, like Lucky Charms, but Cheerios is a close second. I'd most likely use the save $1 on two Big G Cereals. I used this coupon just the other weekend! Our family favorite is Honey Nut Cheerios. We've been eating it for years and now my grandsons are obsessed, too. The coupon I would be most likely to pick would be the 75 cents off any Big G Cereal. 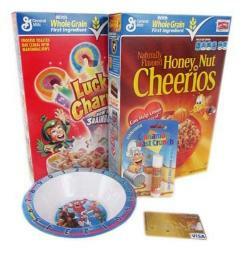 Big G Cereals® when you buy TWO BOXES any flavor Cheerios® cereals: Original Cheerios® • Honey Nut Cheerios® • Multi .. Among all General Mills cereals, Cheerios is the one my family always love, we stock up on it whenever there is a sale and coupon. The coupon that I am most likely to print would be the one for Honey Nut Cheerios. My dad really enjoys it. I would print the cereal coupons. My grocery store doubles coupons so matched with a sale, you would be able to get cereal for a great price! I love Cinnamon Toast Crunch. I love these cereals. They are so yummy! I would print the 75 cents off on Hershey's™ Cookies 'n' Creme cereal! I've tried it and it's good. I will print the Hershey's Cookies and Creme cereal coupon because I haven't tried it yet. My family favorite is Reese's Puffs. We are all crazy peanut butter freaks in our house and we love Reese's peanut butter cups as well. I am going to print the save 75 cents on big G cereals when you buy one box hersheys' cookies'n'creme cereal. I would print the 50 cent Fiber One coupon because I love Fiber One or the SAVE 75¢ ON THREE Pillsbury Toaster Strudel Coupon for the kids. I would print the discount/coupon for the lucky charms since it is my kids favorite cereal to eat. My favorite cereal is honey nut cheerios I like it in the morning or as a snack with no milk. I would print the reces puffs cereal coupon! I used to eat it as a child and I haven't had the stuff in years! I would use the Yoplait yogurt coupons. I buy that every week. My family likes CHeerios or Honey Nut Cheerios. We always have them in the cupboard. honey nut cheerios has always been a consistent favorite in our household - never gets old! I will most likely print the yoplait. And of course we love Reese's Puffs, so I will print that one too. My children love the Reese's Puffs. My favorite is Count Chocula. I loved them when I was a kid and I still love it now. The coupon that I am most likely to print would be the one for Cheerios. It's our favorite cereal. Big G Cereals when you buy Vanilla Chex cereal. I like the original Chex and the Vanilla flavor sounds great. I love a great coupon on a fantastic product. I would most likely use the Bisquick coupon--wish I had seen it two days ago :-). Yummy--so many great cereals. But all of us still like the original Cheerios the best. i would probably print more than one coupon actually. But I would definitely get the save $1 off two Big G cereal coupon, thank you for the giveaway! I would print the coupon for Vanilla Chex at Giant Eagle. I'd like to try that flavor. Cinnamon Toast Crunch has long been a favorite in our house. We all love it! We love Chex cereals, so I will probably be using the Save 75 cents on Vanilla Chex Cereal. Lots of great coupons! I will most likely print the one to save 50 cents on Bisquick! I'd be most likely to print the "SAVE 50¢ when you buy ONE BOX any flavor Fiber One® Protein Chewy Bars" since I'm always on the go and like to get a good dose of protein in. I tried a new cereal, peanut butter toast crunch, recently, and it's now my new favorite. hopefully they keep it around! I'd most likely print the 40 cents off 6 Yoplait Yogurt coupon.Yogurt is great for any meal and also for a snack! I would most likely print the coupon for Hershey's Cookies 'n' Creme cereal. I haven't tried it yet. My favorite General Mills cereal is Cocoa Puffs. I think my whole family likes Honey Nut Cheerios. I would print the Lucky Charms. I printed & used the Honey Nut Cheerios. Honey Nut Cheerios Big G breakfast cereal is our family's favorite! We also like "Magic" Lucky Charms. Our favorite GM cereal is Basic 4 because of the fruit and nuts -- but it is very hard to find! i would print the $0.40/6 Yoplait Yogurt coupon, because we eat a lot of yogurt! My favorite is Honey Nut Cherios, however my daughter loves the magically deliscious Lucky Charms. 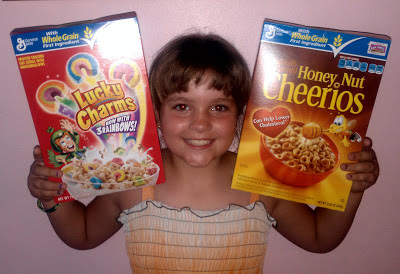 We love Lucky Charms here~the grandchildren want it all the time! I'd print the bisquick mix coupon. My son loves pancakes as does my husband and myself plus I can make doughnuts with it and homemade biscuits. I love cinnamon toast crunch. I have loved cereals with cinnamon from since I can remember. My family loves it to so we always get a big box, in fact majority of our favorite cereals are made by General Mills. The coupon I am most likely to print is the one for 50 cents off when you buy ONE BOX any flavor Fiber One® Chewy Bars, or Fiber One® 90 Calorie Products. Thanks! My favorite cereal as a kid was always Cheerios, and it is still my family's favorite. We like some of the variations, but plain ol' Cheerios are our favorite! I like the Nature Valley Granola Bars coupons. They make great snacks to take along to the beach. I am a fan of Honey Nut Cheerios but also like oatmeal and fruit for breakfast. I would definitely print the General Mills Reese's Puffs Cereal coupon for $.50 because my kids and their friends love that cereal! I would say our family's all time favorite General Mills Cereal Is Honey Nut Cheerios! We like a lot or their cereals, but it seems to be #1! I am going to print the Hershey's Cookies and cream coupon, that should make it around 2 bucks and my kids will be so excited to try it! I would use the Save a $1 on two "Big G" Cereals!!! Gotta Love Honey nut cheerios. Thanks for the giveaway!!! So many coupons I'd love to print, but the first one would be the vanilla chez cereal! I will be printing the coupon to SAVE $1.00 ON TWO Big G Cereals® to pick up some of our favorites. Honey Nut Cheerios is our family's favorite Big G breakfast cereal. Thanks for the giveaway! I would most likely use the save one dollar on two Big G Cereals. I like this coupon I just it a week ago. I would print the save $0.40/6 Yoplait yogurts or the $0.50/1 Reese's Puffs Cereal as my boyfriend loves both! Each of us has a different favorite! Mine is Cinnamon Toast Crunch, my boyfriend love Reese's Puffs and his brother loves Cocoa Puffs! Thankfully they're not picky and will eat whatever cereal we have! I would love to try Vanilla Chex so I would pick the coupon for 75 cents off of vanilla chex! I would print the Fiber One brownie coupon and Reeses Puffs coupon. I could eat those brownies all the time. I like the coupon save .75 on big G cereals when you buy one box hersheys cookies ncreme cereal. My son wants to try the cookies and cream cereal. I would most likely print the 75 cents off Vanilla Chex Cereal. I think my whole family likes that one. I would probably print the $1/2 General Mills cereal coupon. We go through a lot of cereal in this house. Cheerios is a big household favorite. We go through about one box a day. Both of my kids love Cocoa Puffs, and I like the Yogurt Burst Cheerios! I would print the 1$ off two general mills cereal coupons. Good value when you pair it up with a sale! I will most likely print the Lucky Charms and Cocoa Puffs since those are the ones the kids love the most! Kids love Lucky Charms and Cocoa Puffs and me and hubby love the Cheerios line like honey nut! I'd print the save 50 cents on 2 suddenly salad boxes! when you buy TWO Betty Crocker® Ready to Spread Frosting, Supreme Brownie Mix, Dessert Bar Mix ~~ is the coupon I would print off. My husband and I love Honey Nut Cheerios -- not only for breakfast but to also eat dry for a snack. I love Honey Nut Cheerios, especially for a snack out of the box or with a banana and milk. I would print the 50 cents off Bisquick coupon because I'm out of Bisquick right now and need to purchase more. The coupon I am most likely to print is 1.00 off two boxes of Cheerios. My favorite cereal is Honey Nut Cheerios,I eat them as a snack and sometimes for supper. We eat a lot of Big G cereals, but my favorite has always been original Cheerios. My favorite Big G cereal is cheerios. They are healthy & tasty, a winning combo in this house. The coupon I would be most likely to print would be the 50 cents off Liberte yogurt coupon. My favorite general mills cereal is and always has been cheerios. I love it with strawberries. I would print the coupon for Nature Valley Soft-Baked Oatmeal Squares. I love to try new products and these look really delicious. Honey nut cheerios is our favorite big G cereal! I started eating it when I was a kid and we still eat it today! My kids love pancakes. I would print the bisquik coupon and make their favorite meal...over and over again.